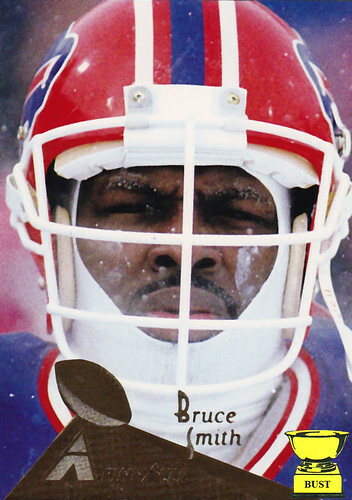 How cold was Bruce Smith when this photo was taken? (A) His eyes had frozen solid and fallen out of their sockets. (B) He invented the full-body turtleneck to deal with the weather. (C) He wasn't cold. He was in the midst of a bitchin' coke party. (D) The snow froze the "Riddell" logo off the front of his helmet. (E) When he got home, he climbed inside the carcass of a buffalo. (F) We're scared. You ask him.